Please join us for one of our exciting AWL programs. To register, email our Administrator. 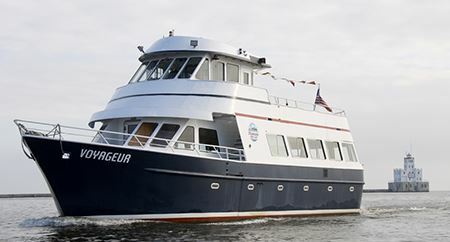 Please join us for a two hour sunset cruise on Milwaukee Boat Line’s Voyageur, featuring light appetizers, a cash bar and great networking. The Voyageur is a modern expedition yacht. The vessel’s climate-controlled salon is outfitted with a full service bar, while the open-air bow and top deck offer breathtaking sightseeing views. Cruise departs at 5:30 sharp, rain or shine. Boarding will commence at 5:15. Please be prompt to avoid disappointment. Cruise will return to dock at approximately 7:30 p.m.
Milwaukee Boat Line’s dock is conveniently located on the RiverWalk, where Downtown meets the Historic Third Ward. The dock is located at 101 W. Michigan St. Suggested parking is available at 518 N Plankinton Ave. Volunteers are needed to help fill the boxes. It is easy and fun work and doesn't require heavy lifting. Volunteers must be 12 or over, and wear durable shoes and work clothes. Feel free to invite co-workers, friends, and family. We are asked to have at least 18 volunteers, so help spread the word! Please RSVP (and direct any questions) to Lauren Maddente.